We all have events in our lives that aren’t the most pleasant to look back on, but when traced with the correct pencil of perspective we can firmly point out maybe a benefit or two gained from the experience. 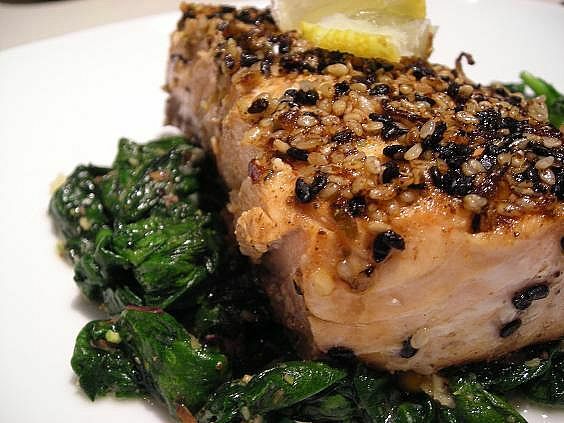 This Sesame Seared Salmon is one of the good things that came from a not-too-pleasant occasion during my culinary school days. I was a member of our school’s culinary competition team. The local culinary schools engage in a friendly student competition each year at a big food show that goes on in February. We started our practices in October, meeting once a week to work on knife skills and a four-course menu that needed to be done in a 90 minutes window on the day of the competition. The whole thing was fraught with elements of disaster from the start, mostly due to one team member who was so bloated with self-importance that he refused to allow anyone to tell him what to do or work with anyone else on the team to make it a smooth venture. No amount of nagging or threats could get the team captain to kick him off and replace him with someone easier to work with. We plodded on, although I knew the whole thing was going to be only slightly less catastrophic than a thunderous tsunami. My part of the team was to do the appetizer and I did a three part salmon plate; one was a Salmon Tartare in a Savory Cornet shell, the other was a Vegetable Bisque with Seared Salmon and the third was bite-sized nuggets of this gorgeous Sesame Seared Salmon. Outside of absolutely loving the Sesame salmon, making a friend for life in my teammate Emily and getting to spend a lot of time with some amazing chef mentors who taught me a great deal, the entire incident was one that I often look at with utmost regret. We placed dead last and quite frankly, it was a little embarrassing to go up against schools who spent an entire year prior to the competition in a class that did nothing but mold them for the end result. We looked like a group of rusty, beat up old clunkers at a Porsche convention. This salmon, however, was all my creation and I couldn’t have been more pleased with it. I really need to make it more often. 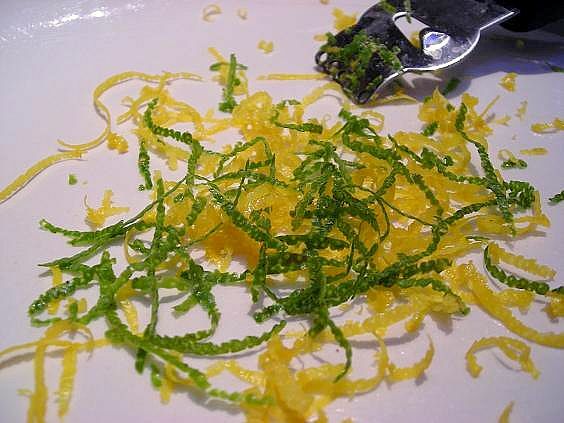 The seasoning is a simple blend of Old Bay, lemon and lime zest, a little squeeze of either juice, salt and pepper and a mix of black and white sesame seeds. Press the fish into the mix, heat a skillet to smoking and drop the fillets in a small puddle of good olive oil. Turn the heat down slightly, cook until the side is burnished and fragrant and flip it over to finish. This meal, indulged in on a kid-free night was so full of flavors that Mike and I could do little else but gaze at each other in awe; firm moist salmon with the delightful citrus-y crunch of the sesame crust and my absolute favorite parmesan-garlic sauteed spinach that ended up perfectly cooked even when I was afraid I over-did it. I made my own Old Bay style blend instead of buying an overpriced tin of it. I’m really a spice hound and have a huge shelf in my kitchen that is full of different spices. I prefer to make my own blends- I made garam masala when I needed it and was able to make a suitable Chines 4-Spice blend that managed quite well without the star anise. Easy access to bulk spices helps too. The recipe for Old Bay that I found on-line required 13 ingredients- I had 12 on hand. Blend all ingredients well and keep covered. Should make about 1/4 cup. Note: I must have put more than a dozen bay leaves into my spice grinder before barely making the necessary tablespoon of ground bay leaf. I did not have the mace. Do not sub celery powder for celery salt or the flavor won’t be right. 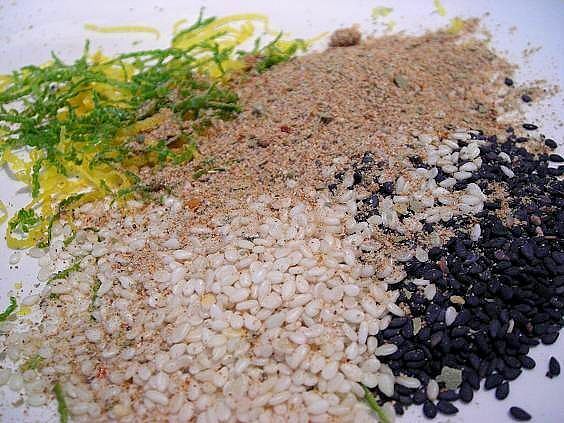 Mix zest, Old Bay and seeds on plate, season with salt and pepper. Stir juices together in bowl and whisk in oil. Brush this over fillets and press into seasoning mix. Heat skillet with olive oil and when hot, place fillets, seed side down in oil, reduce heat and cook for about 5-8 minutes. Carefully flip fillets over and cover, turning heat down to medium low and cook until fish flakes with a fork, about 6-10 minutes more depending on thickness of fillet. NOTE: Don’t allow the fish to sit long after brushing on the juice/oil mixture. The acids in the citrus will begin to ‘cook’ the fish, ceviche style. Alternatively, you can brush the fish with plain oil and then when the fish is cooked, drizzle the citrus juice over the top. Heat oil of choice in skillet and gently saute garlic until very fragrant and soft, about 3-4 minutes, stirring continually. Add in parmesan cheese and as it softens, quickly drop in the spinach leaves and begin to stir, tossing with the garlic and melted cheese. Reduce heat when leaves have wilted and allow to cook for several more minutes until of desired texture, stirring occasionally. Some like it toothsome, others like it softer. Season with salt and pepper. We topped this with chopped nuts too. 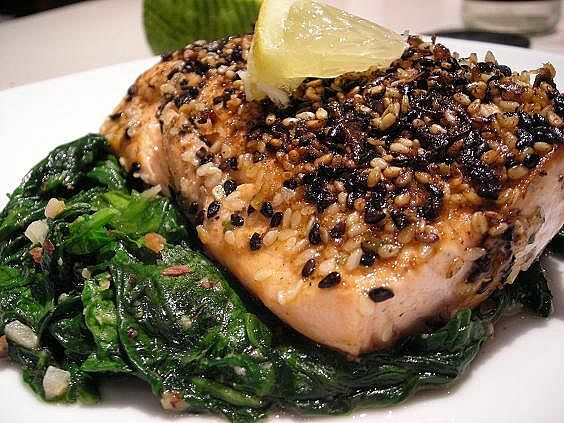 This salmon looks delicious, I just love black sesame seeds. They add a lot of color and flavor. WOW! This looks sensational! I will have to try this. The darling hubby loves sesame seeds. Yum. That fish looks incredible, I will definitely be trying this recipe. And I will make my own Old Bay. Thanks so much for the recipes. Kate this looks gorgeous! Oh so yummy. The flavorings sound perfect. That looks delicious! I have some salmon in the freezer and I think this is what it’s destined for. 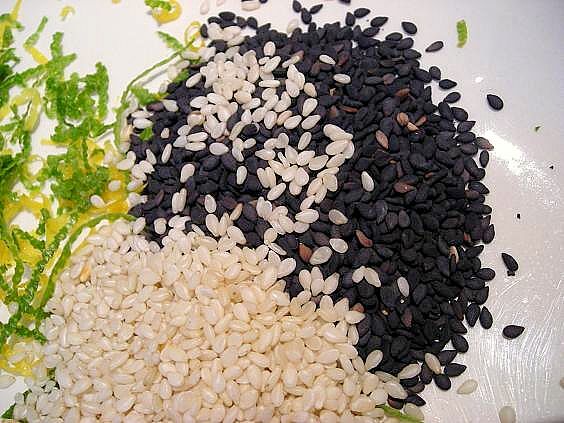 Are the black and white sesame seeds just to make it pretty, or is there a taste difference? I only have white ones.